(Phys.org)—The team of researchers working on the Breakthrough Listen project (based at the University of California, Berkeley SETI Research Center) has released preliminary findings after sifting through several petabytes of data obtained from three telescopes involved in the research project. The findings have been made available on the project's website as the team awaits publication of a paper in the Astrophysical Journal. 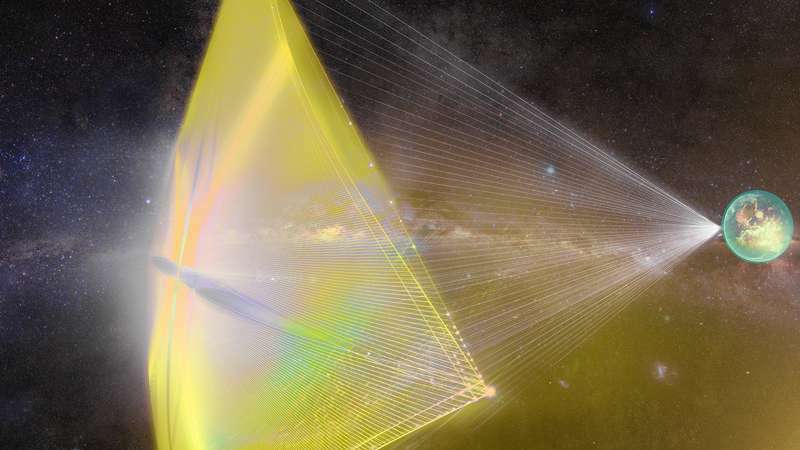 The Breakthrough Listen project was publicly announced in 2015, and has been backed by Stephen Hawking and perhaps more importantly by Yuri Milner, a Russian billionaire who, along with other backers, has put $100 million toward the 10-year project. Over the past two years, the Parkes Telescope in Australia, the Green Bank Telescope in the U.S. and the Automated Planet Finder optical telescope at Lick Observatory also in the U.S. have been dedicated to listening to radio signals emanating from space in the hope that one or more of them might be generated by alien life forms. Several petabytes of data have been collected after pointing the telescopes at 692 stars—each gets three five-minute observations, which are interspersed with observations of other targets. Thus far, the team has designated 1709 stars for study. The team has also broken down the stars to be studied into two categories: those within 16 light years of the sun, and those belonging to a sample spread across a main sequence and some branch stars which are no more than 163 light years away. Project members made headlines last year when they noticed irregular dimming by Tabby's Star—subsequent study suggested that rather than indicating signs of extraterrestrial life, the dimming was most likely caused by comet fragments interrupting signals. The team reports that to date, project members have identified 11 signals as worthy of a closer look, but at this time, do not believe any of the signals represent alien communications. They also note that the process of sifting the data is rather simple and straightforward—first, distinguish artificial signals from natural signals by looking at irregular behavior such as modulation or pulsing patterns. The next step involves making sure any such irregularities are not generated here on Earth. The software is open source so that anyone who wishes to participate in the search can do so. I remember when I was young, back before cable, I read that a truck could drive by your house and tell which tv channel you were watching. I knew a little about electronics and I thought "No Way!" How can we be so sure no advanced level of technology can't do the same with light? Seems impossible to me but so did outsiders knowing which station I was watching. In our society an invasion of privacy is abhorrent. Perhaps in another alien society it would be a capital offence. This kind of research is like playing the lottery, in that it's safe to assume you didn't get anything... except, the lottery has much better odds. On the other hand if they do find something then that's the jackpot of all jackpots. So...why not play? But seriously: if there is a way to circumvent the speed of light limit (like some sort of Alcubierre drive) then that would be a far better (i.e. faster, less costly, and more secure) way of moving information about the place. In that case we can listen all we want with the above method in a universe teeming with life and never see anything. In that case we can listen all we want with the above method in a universe teeming with life and never see anything. Well we're just over 1 century of using high power broadcast EM and we're now moving communication into fiber and low power EM rapidly. Civilizations may go dark to our level of technology long before they learn to signal faster than light. It might be statistically near impossible to find other ET using EM radiation because such technologies dominate for such short periods. such technologies dominate for such short periods. But what about mega changes a advanced civilization might make to their environment(Solar System, Galaxie)? Why would they? If anything I'd expect advanced civilizations to become less visible due to their environmental impact - not more. If you can engineer to live in any environment (maybe even space?) why would you build....anything....on a planet? Even if you don't engineer yourself: humans are already twigging to the fact that changing the environement isn't a good idea (re. climate change) - and that it is far better in the long run to act in ways that do not do so. It's like ddaye says: The window for noticeable changes/emissions is probably very short. Was the beginning of the known universe "big bang" or did the known universe evolved from its predecessor? A big bang energy explosion could be part of an endless cycle of events which start with a singularity of "pure energy". This could have developed from a previous universe as a central black hole until it becomes, a pure energy bomb. This grows until has exhausted all of the entities in its environment and reaches a critical point which is unstable, releasing its energy which condenses into physical matter initiating of a new universe. For this new universe, this is a big bang which. transmutes into matter with t gravity and forms its own galaxies and black holes. It has become a new expanding universe. It enters its collapse phase creating black holes which accelerate collide and coalesce. Gravitational binding occurs, mass dissolves into pure energy. It mirrors the original pure energy bomb. Sounds really good but the problem seems to be there is no collapse phase. Dark energy is expanding the universe at a ever increasing rate. There seems to be no other energy that behaves in this way. It is expanding at faster that light speed. But that does not contradict the speed of light laws because it is the whole universe that is expanding faster and faster. Like a balloon that is filling with air, all points on the surface are growing further apart. The question may not make much sense. Consider that at the big bang stuff didn't jujst come into being but spacetime itself. So asking for a state 'before' in s etup where time isn't helpful. It's like asking: "Without color - what color is blue?". If you invalidate your premises in your question you get nowhere. Dammit. I think my keyboard mangled that beyond readability. What I was trying to say is this: The concept of 'before' doesn't make much sense outside the universe as the universe isn't just the stuff IN it but also the spacetime in which that stuff exists. The big bang didn't "explode into an empty space". It created that space (and time) along with it. That was a great explanation Anti. Does that imply that as space inflates parts of it must be moving towards other parts and not away as I always thought? Also doesn't gauging distance of stars via the red shift imply a common starting point. Does that imply that as space inflates parts of it must be moving towards other parts and not away as I always thought? Think of the universe as a balloon that's being inflated All points on the surface of the balloon are moving away from each other at a accelerating speed that is now faster than the speed of light. The balloon analogy falls short on the inside where the air is. But it works the same way throughout the universe. All things are moving away from each other as the universe expands. Here is where it gets tricky. On the inside of the balloon you have to imagine establishing a specific number of points throughout it at the start. As the balloon expands the points are moving away from each other faster as you get further away from the center.. (??) That is why where we are now compared to the center of the universe we can't see the expansion in relation to things that are relatively close. I probably did not do that explanation justice. It's all centers, all the way down. I may be wrong, but it appears to me that as mass continues to accrete around galactic centers, time near those centers of mass slows and local space stretches, giving the galaxy-riding viewer the effect of an expanding universe. And as our galaxy slowly grows in mass, the effect, looking outward, is of accelerating expansion. Perhaps what we think of as the Big Bang was just a much, much flatter SpaceTime? "Think of the universe as a balloon" Well that is expanding from a central point. Anti says that is not the case. Like all analogies it is only partly correct. Plus it is confusing because time is not taken into account with the balloon analogy. I think of it like this, for us laymen it is a good analogy we can picture in our heads. But it is a poor analogy if you want to go deeper into understanding the expanding universe. Perhaps even thinking of it like a balloon is a good place for anyone to start getting their head around it. At which time you start to see the flaws in the analogy and go into understanding the universe expansion as related to time.